BAMAKO (Reuters) - Mali confirmed its first case of Ebola on Thursday, becoming the sixth West African country to be touched by the worst outbreak on record of the hemorrhagic fever, which has killed nearly 4,900 people. 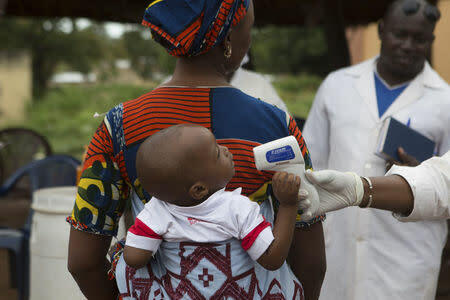 Mali's Health Minister Ousmane Kone told state television that the patient in the western town of Kayes was a two-year-old girl who had recently arrived from neighboring Guinea, where the outbreak began. "The condition of the girl, according to our services, is improving thanks to her rapid treatment," the minister told state television. A health ministry official, who asked not to be identified, said the girl's mother died in Guinea a few weeks ago and the baby was brought by relatives to the Malian capital Bamako, where she stayed for 10 days in the Bagadadji neighborhood before heading to Kayes. A ministry statement said the girl, who came from the Guinean town of Kissidougou, was admitted at the Fousseyni Daou hospital in Kayes on Wednesday night, where she was promptly tested for Ebola. People who came into contact with the patient in Kayes have been identified and placed under watch, the minister said, but he appealed to any person who believed they may have had contact with the girl to step forward. The vast majority of the deaths and nearly 10,000 cases of the disease have been in Guinea, Liberia and Sierra Leone, according to the World Health Organization (WHO). Small outbreaks also spread to Senegal and Nigeria, Africa's most populous country, but they have since been declared Ebola-free by the WHO. The official numbers are known to be under-reported and the true death toll may be three times as much, the WHO said this week. A completely separate outbreak in Democratic Republic of Congo in central Africa also appears to have been contained.